I talked with the Pacers owner several times while covering the team for the Star, because he was the one who would communicate with the media when it was necessary or appropriate. His older brother and co-owner Mel wanted no part of it. The brothers have a great story, growing up poor in Brooklyn. It’s one of the luckiest moments in the history of Indianapolis that Mel was assigned to Ft. Benjamin Harrison for his Army duty. He stayed after completing his service to go to work for a shopping center developer. Herb later joined him. Together they broke off on their own and went on to build a national business developing shopping malls. 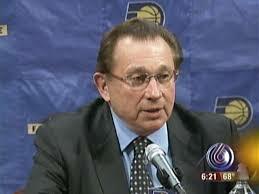 That put them in position to save the Pacers when they were on the verge of being sold to a group from Sacramento. Very few other people in Indianapolis, if any, had the resources to buy the Pacers at that time. Herb hasn’t received the credit he deserves. He doesn’t seek media attention, has avoided personal scandal, helped build a major business from scratch, has kept its headquarters in the city, and has contributed greatly to the city’s economy – not to mention the sports landscape. Beyond all that, he’s always come across to me as a regular guy who hasn’t forgotten his humble beginnings. You want humble? He slept in a dresser drawer as an infant in Brooklyn because his parents couldn’t afford a crib. We talked in a meeting room at Bankers Life Fieldhouse one afternoon. He was running late, and profusely apologized for it. It was worth the wait for me. To my knowledge, this is the longest individual interview he’s ever conducted.